LMS – Casino Essentials Title 31 training and more. Our Learning Management System is an online web-based learning platform designed for the Casino industry. Train employees, test their knowledge, track their progress, review reports and print certificates of completion all from one place. Many companies are using our Learning Management System to save thousands of dollars in expenses while reducing the risk of fines and penalties. Train employees, test their knowledge, track their progress, review reports and print certificates of completion all from one place. Many companies are using our Learning Management System to save thousands of dollars in expenses while reducing the risk of fines and penalties. 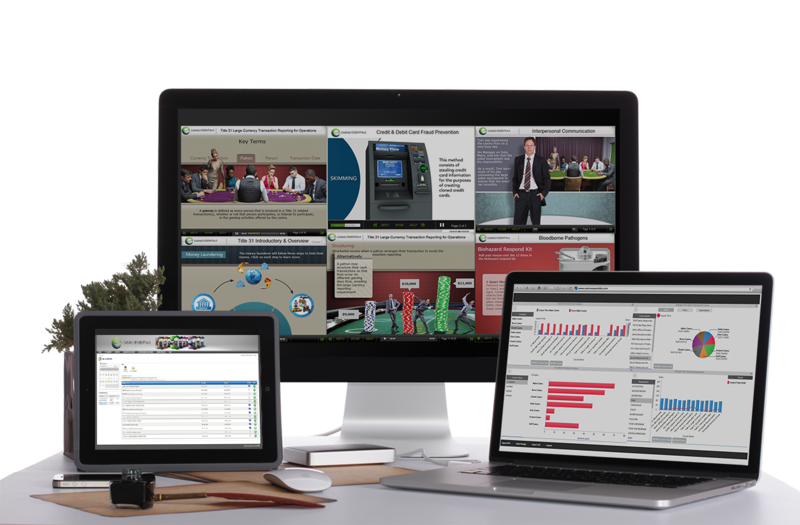 Real-time message integration instantly informs learners, trainers and supervisors of events such as overdue or failed courses. Store all your training records in one place. Use the LMS to track classroom training in addition to online training. Casino Essentials affordably customizes or simply converts any of your training, videos or documents for ease of use in the LMS. We are with you every step of the way to assist with every aspect of your Learning Management System, consistently providing World Class Customer service! Just listen to what our Clients are saying about us!